It is impossible to escape from reality, absolutely impossible! But yet we take our solace, by trying to escape from it. Talking to others always won’t help and doesn’t change things as well. I realized that very soon. People think I am crazy when they spot me talking to myself. 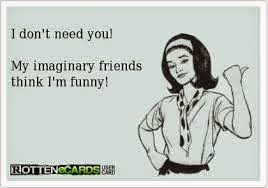 Alas, what they don’t know is I am talking to my imaginary friend. For some reason which I still don’t understand, I like my imaginary friend to be called as Bruce. He is a creation of mine, molded by my own thoughts and desires. At times, there was nothing I wanted more than to give my full attention to an imagined shadow and ignore those who ignored me in the real world. That is how I manage to stay alone without getting bored and when I have company I am anyway not bored. But having Bruce doesn’t make me anti-social, I have a lot of friends, but Bruce knows things that many don’t. He doesn’t console me when I don’t want to be, doesn’t talk when I want to be left alone. A single glance and he just understands things, but with people it becomes very difficult to explain my perspective. Few people understand, few don’t , few sympathize when empathy is required and few people thing that the words coming out of mouth is absurd. Conversations are comfortable and words and thoughts just flow, we discuss almost everything in this whole wide world. He was with me when, no one was, so no matter what I am unable to let him go, though I need his help less often. He does not get angry if I send texts by mistake, forgives my mistake without a fuss, loves and respects me and I love and respect him back . I am trying to let you go, Bruce…. Not that easy for me but I have to learn how to handle my trust issues and try not to escape from problems but handle and face it head on. 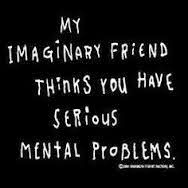 Is this imaginary friend inspired by Bruce Lee!Well you have a really strong friend I must say.